The stage drama song Haa Haa Landae used to create pleasant sensations in peoples’ minds couple of decades back. This is the very reason this song was often sung in sing-song get-togethers and functions. The song came in Biso stage drama made by Hector Kumarasiri and was originally sung by Rodney Warnakula. Kumarasiri, a well known senior artiste and a dramatist, has now ventured into film-making. Titled Abhinikmana, Kumarasiri’s first feature film is scheduled to be screened in theaters shortly. Q: This is your maiden full-length film. Are you satisfied with the outcome? A: Certianly. The film has a somewhat unusual theme. 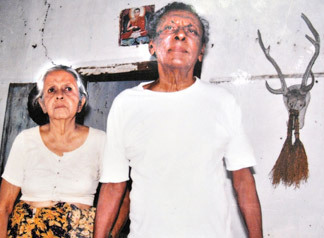 Sri Lankan filmgoers will have the rare opportunity of seeing the veteran Joe Abeywickrama’s last performance in Abhinikmana. Q: You had been actively involved in the field of art for many decades. A: True. I was engaged in journalism, script writing, short-film making and stage drama direction to communicate my philosophy in life. I was brought up in a Buddhist background. English novelist E M Forster had said, “I do believe in Art for Art’s sake”. Any piece of art should start with enjoyment and end with wisdom. My belief is that we should encourage people to understand the true values in life through art. Creativity of an artiste is brought from previous lives. This is known as ‘Wasana Gunaya’ (lady luck). Thus the artiste with his creation must enhance the wisdom of the people. Empathy, humility, sacrifice, patience needs to be in abundance in a piece of art. A wise society at large will pave way for a new world sans hatred. The artiste can spearhead this process. Q: How were you inspired to engage in art? A: My father was my hero and role model. I was firstly inspired by his humility. I am the second in a family of 10 children. Ours was not a poverty stricken family. However we lead a very simple life. Those days the society treasured values to a great extent. Hospitality was part and parcel of any household’s life-style. I have watched how my father fed us and entertained neighbors and friends at the same time. I was a mischievous lad. While in Rajagiriya Hewavitharana College, I took part in art society activities. I had a liking towards reading Russian novels. My political liking was towards Communism. After leaving school, I joined the Aththa tabloid. While being there, I got the opportunity to follow a course in cinema conducted by the National Film Corporation in 1974. I co-edited the film magazine Cinema in the 1970s. Q: Your next stop was in the stage-drama direction field. A: My first stage drama Loka Dekai…Eka Minihai was based on labour unrest. That was followed by Rajjuruwo Mun, Dadin Bidin Doong, Devlo Doni, Siyam Poottuwa, Biso and several others. Somi Ratnayake and Richard Weerakkodi made their maiden appearances on stage in Dadin Bidin Doong. Rohana Weerasinghe composed the music.I did Sathara Warang Raja Daruwo in 1974. The story revolved around the disrupt done by bureaucrats. I have won the Presidential award for Siddhartha script in 1982. My script for Maddumaya won the award for the best script at the drama script competition held by the Cultural Ministry. The Public Sensor Board has banned two of my scripts. The Helidarawwa stage drama scripted by me and co-produced with Udeni Chandrasiri was staged 5000 times. We are doing rehearsals of Biso once again. Dikkasaadaya directed by me was the first teledrama to be telecasted on Swarnawahini. 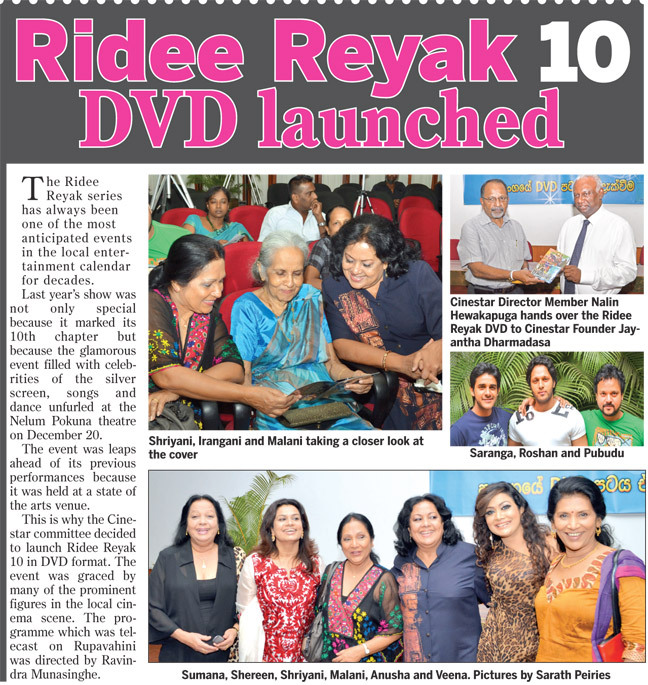 It featured Vijeratne Warakagoda, Menike Attanayake, Granville Rodrigo and Shirani Kumarasiri. In 1984 I did the short-film Nikmayaama. It featured the late Simon Nawagaththegama in the lead role. It became a teledrama later with Granville Rodrigo in the lead. Q: How did Abhinikmana happen? A: I have scripted and directed this film to coincide with the 2600 Sambuddhatwa Jayanthi. The storyline revolves around a true incident that had taken place in the Buddha’s era. Buddhadassi Samanera thera gets to know his ailing parents have no one to look after them. The thera comes home in robes to help out his parents and this action of his is misunderstood by the chief incumbent of the temple. This distraction distances Buddhadassi thera from the temple. Seedevi, the beautiful damsel in the neighborhood who comes to offer a helping hand, hints she is ready to go the extra mile. The thera who is not tempted sticks to his just cause of looking after hia parents. Many events taking place brings to the story to a climax. The cast includes Joe Abeywickrama, Irangani Serasinghe, Sudharshana Bandara, W Jayasiri, Mahendra Perera, Malkanthi Jayasinghe, Manohari Wimalathunga, Lochana Lakshika, Jeewan Handunneththi and many more. The theme song is written by Prof Sunil Ariyaratne and sung by Shasthrapathi Nimantha Heshan, who is my son. Nimantha is also the music director of the film. This is his maiden film music direction. The camera was handled by Nimal Nakandala. The art director is Manoj Wickramasinghe. Yasalal Liyanege functioned as the assistant director with his team. Abhinikmana was co-produced by four young scholars: Sarath Subasinghe, Nimal Chandrasiri, Suranga Wijeratne and Dinesh Ranjan. Choreographer-actor-director Prabhu Deva, who shifted bag and baggage to Bollywood after he struck gold directing Hindi movies, is back to doing what he does best. He is playing the role of a dancer in the Tamil version of ABCD — Aadalaam Boys Chinnadha Dance. Touted to be India’s first ever 3D dance film, ABCD — Anybody Can Dance is directed by ace choreographer-turned-filmmaker Remo D’Souza. “I am thrilled and excited,” said Prabhu, who is adept at various styles of dance, including Western, contemporary, ballroom, hip-hop to Indian classical forms like kathak, Indian folk and even local street dance. It’s the first time that the actor has dubbed his own voice for the Hindi version of the film. “Though I am not fluent in Hindi, I wanted to give it a shot to give that extra edge to the character I play.” He had help from a sound engineer friend. “I have spoken so much in Hindi. It was a superb experience,” he said. Since Prabhu is busy with his other commitments including his directorial venture, Ramaiya Vastavaiya, he will undertake the overseas promotion of ABCD with the help of a hologram. The buzz is that Prabhu will be talking to the media in Dubai, while his hologram will be projected at events in London, New York and Toronto. “It is a huge innovation for the film. A 3D hologram projection is a perfect fit for the promotions as ABCD is also India’s first 3D dance film,” Remo had earlier stated. Produced by UTV, the movie features Bollywood choreographer Ganesh Acharya, Salman Yusuff Khan of Dance India Dance fame, Lauren Gottlieb, Dharmesh Yelande and Kay Kay Menon. ABCD will begin screening at Majestic Cineplex's Platinum theatre from February 8. They danced wildly full of youthful vigor. And all who watched them, grew desirous. With their powerful limbs they swayed to the music of Shine by Bond. Wearing colorful attire they were the very image of the Mara's daughters. And they danced at the Muhurath of Agni Varsha. They were the dancing group of Anjali U Shadows. The Muhurath of Agni Varsha took place recently amid a gathering of Colombo Socialites along with Producers Nimal Kularatne and Dr Arosha Fernando and Director Nalaka Withanage. “I am very happy to be here a part of the Agni Varsha Muhuratha. I am here to witness yet another Muhuratha of Dr Arosha Fernando which has taken place in a short period of several months. Beyond personal satisfaction and happiness, I am happy for resurrection of Sinhala cinema. This is a rarity amongst producers. Even after the production of the first film and before its screening the production of a second film has taken place. The entrance of Dr Fernando, a new face in the industry is an incentive to Sinhala cinema. We have a duty to protect these new producers. All in the Sinhala cinema industry must rally around these producers and support them. The dearth of such producers is the reason that in recent times the Sinhala cinema industry has fallen. The Dark period that Sri Lanka as a country underwent has been injurious to Sinhala cinema. The teledrama industry can in now way replace or be equal to the film industry. The quagmire the Sinhala film industry was I prompted many in the industry to switch over the teledramas. Now with peace, Sri Lanka is developing. The country’s economy is in good shape and with that progress new cinema halls are coming up. Colombo is coming up well. We need expertise in Sinhala cinemas. These experts can only be a positive influence. We are boldly moving forwards into a new era,” said Director General of the Media Centre for National Security Lakshman Hulugalle. Speaking at the event actress Anusha Damayanthi noted that Nalaka has shown his mettle with this masterly directing of Rupantharana. “He is one of those cinematic personalities that will make Sri Lanka proud,” she said. “We have seen Nalaka’s skill in Anithya and Rupantharana. A new comer into the film industry he showed his prowess in Anithya. I was fortunate to receive a small part on Rupantharana. I am very happy to have been asked to play a major part in Agni Varsha. 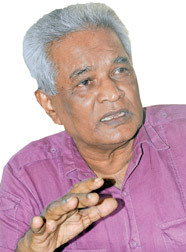 For six months he trained us in the art of acting,” Kalum Kularatne expressed. E A P Films and Theatres, Director CEO Thushan Meemanage said, “I have known Dr. Arosha for some time now. Even though some spell doom for Sinhala Cinema there is no such thing. Every year the revenues increase.